Explore the beautiful Hudson Valley, head to Montauk, Nantucket, the Catskills, Lake Placid, the Poconos, the Hamptons or Cape Cod - there are many incredible weekend trips from NYC, including amusement parks, mountains and lakes. Castle Hotel & Spa is a romantic spa getaway from New York City. 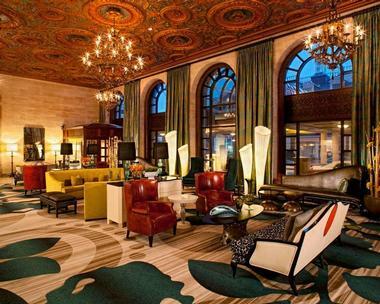 The hotel has a 8,700 square-foot THANN Sanctuary Spa and romantic accommodations with four poster beds, fireplaces, turret alcoves and Hudson Valley/Manhattan Skyline views. The property is just 45 minutes north of Manhattan which means that you can easily visit the spa on a day trip. Have a romantic dinner at the award-winning Equus, and take a stroll in the woods. The hotel has an outdoor swimming pool with a Jacuzzi, fitness center, and offers luxurious in-room spa services for additional relaxation on your weekend trip. Rates start at $410 per night. Browse more quick weekend getaways. The Thayer Hotel has amazing vies of the United States Military Academy and Hudson River and is a national treasure that has hosted multiple presidents and international leaders over the years. There are 151 guestrooms and suites, including twenty-two Executive Suites and two Presidential Suites. All rooms have 32-inch flat-screen TVs with Direct TV and HBO, large work desks, oversized bathrooms with hair dryers and heat lamps, voice mail, Keurig coffee machines, irons, and high-speed internet. You can choose from double beds, queen, or king beds. You can also get a room with a fridge or crib. Suites have larger TVs, sitting areas, extra room, additional bedrooms, kitchenettes, bars, dining rooms, and/or other amenities. Guests can enjoy the Sunday Champagne Brunch or another meal at MacArthur’s Riverview Restaurant with its old world charm and Gothic windows, which his perfect for romantic dinners or business lunches. General Patton’s Tavern serves light meals and favorite drinks. Relax at Zulu Time Rooftop Bar and Lounge with its views of the Hudson. Set in a historic 1880s homestead, Shinn Estate Farmhouse is one of the top wine country weekend getaways from NYC. Surrounded by undulating farmlands in Mattituck, NY, this beautifully restored farmhouse offers a tranquil and secluded escape from the city. Four well-appointed guestrooms are spacious and light, with antique pine floors and modern en-suite bathrooms with deluxe amenities. Start the day with a sumptuous farmhouse breakfast in the sunny breakfast room overlooking the vineyards, where a huge table is laden with seasonal creations and homemade delights, such as freshly baked scones, savory biscuits and slow-cooked eggs. Spend the day exploring the farm - stroll through the vineyards or take a scenic bike ride down Oregon Road. Mattituck offers a variety of museums, theaters and outdoor activities, including fishing, sailing, horseback riding, and kayaking. Rooms start at $169 per night. An artful assimilation of architectural innovation and contemporary interior design creates a masterpiece in the luxurious Homestead Inn. Surrounded by acres of manicured gardens on the Belle Haven peninsula in Greenwich, this timeless boutique hotel epitomizes elegance and sophistication. In an effortless blend of old and new, sumptuous suites are individually designed to create contemporary-chic abodes, adorned with plush décor, exotic Persian carpets, and beautiful artworks ensconced in alluring color. The hotel is home to the renowned four-star Thomas Henkelmann Restaurant, famed for its exceptional contemporary French cuisine and seasonal specialties. Two private dining rooms are available for special occasions and the extensive wine list will delight wine-lovers and aficionados alike. Rooms start at $350 per night. The Inn at Shelburne Farms in Vermont is a historic getaway located on a 1,400-acre working farm where visitors can learn about sustainable agriculture in a beautiful setting. Accommodation options include individually decorated guest rooms, historic cottages and houses. If you are looking for privacy, ask about the Treehouse, a 1890s bungalow surrounded by trees and views of Lake Champlain. The inn restaurant is one of the best farm-to-table restaurants in the United States, featuring a seasonal menu made from locally sourced ingredients, including organic fruits and vegetables from the Market Garden, pasture-raised lamb, beef & veal, pastured eggs and delicious maple syrup. The Shelburne Farms campus is made up of several distinct areas, including the Farm Barn which houses the Children's Farmyard, an organic bakery, cheesemaking facility, a furniture maker and an elementary school. The Coach Barn hosts the Art Exhibition & Sale in September and other nonprofit events. The Solar Orchard behind the Coach Barn generates enough power for 25 houses, in line with the farm's commitment to renewable energy. Rooms at the Inn at Shelburne Farms start at $155 per night. The inn and the restaurant are open from May to October, but the Welcome Center & Farm Store remains open year-round. The Dan'l Webster Inn is a historic Cap Cod spa weekend getaway with 48 rooms and suites, perfect for couples or girlfriends. The Jarves Suites have romantic hand-carved beds, gas fireplaces, oversized whirlpool tubs, and heated tile floors. Amenities include eco-friendly 300-count cotton triple sheeting, micro-fiber bathrobes, and Olive Branch Botanical bath products. Just one hour from Boston and four and a half hours from New York, the inn is a relaxing getaway from the city. Relax at the Beach Plum Spa with a massage, body treatment, manicure or pedicure. In the summer, swim laps in the outdoor pool which is surrounded by beautiful gardens, or rejuvenate in the heated whirlpool. The restaurant serves traditional favorites such as filet mignon and tender prime rib in four different dining rooms. The Music and Webster Rooms are candle-lit, and the Conservatory serves meals in the sun or moonlight. Rooms start at $184 per night. From 6 accommodation options, spa, golf, the Wildlife Academy, a choice of pools and children's programs, Nemacolin Woodlands Resort in Southwestern Pennsylvania is a family getaway from NY that's all about choice. The resort is situated on 2,000 acres with 36-holes of championship golf, a 140-acre sporting facility and an Orvis Endorsed Fly Fishing school. The Adventure Center offers many fun activities for the whole family, including an animal nursery where you can see tigers and black bears. There is also horseback riding, daily art tours of the multi-million dollar Hardy Family Art Collection, cooking classes, wine tasting and 14 boutique shops. Head to the indoor kids' pool, just three feet deep, with your younger children. Or play on water slides at the Paradise Pool. Land's End Inn in Provincetown, Massachussets offers spectacular ocean views and romantic sunsets. The inn is set on Gull Hill in the town's charming West End. The property has beautiful gardens which are in full bloom during the warmer season. Take romantic walks through the garden, have a cup of tea surrounded by flowers, and stroll on the beach just steps from the inn. Activities include dune tours, biking, trolley tours, sailing and whale watching. If you are planning a romantic trip, book the Bay Tower room which has soaring ceilings and panoramic ocean views. If it wasn't for the lavish decor and art, you would feel like you are sleeping in a lighthouse high above the ocean. The Tower Room has two decks for relaxing outdoors with a view. Guest rooms overlook the water and are individually furnished in different styles. Rooms start at $300 per night. Only a two-hour drive from Manhattan, located in the beautiful Catskill Forest Preserve, Emerson Resort and Spa is an upscale rustic getaway overlooking Esopus Creek and the magnificent Catskill Mountains. The resort provides elegant and comfortable accommodations in a large modern 53-room inn or a charming Adirondack-style lodge, with three luxury suites with gas fireplaces, private decks, and all modern amenities. The guests enjoy a full range of treatments at the luxury spa, original Catskill cuisine in the elegant Woodnotes Grille restaurant, and the fascinating World’s Largest Kaleidoscope. The widely acclaimed spa has 10 treatment rooms, a large fitness center, an outdoor pool, and a hot tub. The World’s Largest Kaleidoscope is located in a former silo fitted with a mini-theater presenting “kaleidoscopic” films. Outside the silo is a shop and display area selling everything related to kaleidoscopes, such trippy tubes for kids and interactive, artist-made ‘scopes. 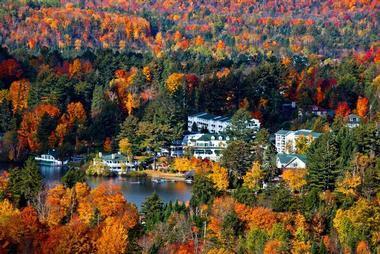 Hotel Saranac is a 100-year-old hotel and an iconic landmark located in the picturesque Saranac Lake village. A perfect base for exploring the surrounding Adirondack Mountains, the hotel has been meticulously renovated with care to preserve its charm and architecture. The magnificent Great Hall, inspired by a 14th century Italian palace, is there to greet the guests. The rooms and suites also seamlessly blend modern and historical with ornate crown moldings, smart TVs, free Wi-Fi, and other modern amenities. Some rooms have sofas and desks, while suites add mini-fridges, private bedrooms, and additional TVs. Premium suites have a wet bars, sofas, and dining areas. The guests enjoy shuttle services and mountain bikes to explore the mountain trails. The hotel also has the Campfire restaurant, Great Hall Bar, and Ampersand Spa and Salon. The DeBruce has been acclaimed by Condé Nast Traveler as one of the best new hotels in the world, situated on 600 acres along the bands of Willowemoc Creek in New York's Catskill Park. The hotel is a sleek luxury revamp of a century-old facility, which has been previously known as the Willowemoc, St. Brendan's, and the Debruce Country Inn. 14 lovely guest rooms and suites are decked out with beautiful wood floors, marble bathrooms, and historic claw-foot tubs. High-end amenities are stocked in each room, from Sferra linens to designer toiletries from Malin & Goetz. All guests have access to half a mile of private riverfront area for fly fishing, with over 30 miles of nature trails in development by trail expert Cima Bue. Other amenities include a spa, an outdoor pool, and elegant communal lounge space within the hotel's Conservatory. A beautiful estate overlooking the Hudson River in Garrison, Boscobel is the perfect place for a spring picnic among blooming daffodils, tulips and cherry trees. Visit the Herb Garden & Orangery, the Apple Orchard and the romantic Rose Garden. In the summer, the Hudson Valley Shakespeare Festival takes place on the Front Lawn which overlooks the Hudson River. In addition to the incredible gardens, the house features furniture and decoration from the Federal period. The mansion is set high above the river and offers scenic views of the Hudson River Valley. The property, located at 1601 Route 9D in Garrison, can be reached by car of by train from New York City. If you are traveling by train, take the Metro-North's Hudson Division from Grand Central Station to Cold Spring. Since the property is 1.5 miles from the station, you can call 845-265-TAXI to arrange for a car to meet you. The attraction is open daily, except Tuesdays, Thanksgiving and Christmas. It is closed during January, February, and March. From April through October, the property is open from 9:30 am to 5 pm; in November and December, it is open from 9:30 am to 4 pm. Admission is $17 for adults; $8 for children ages 6 to 14; $14 for seniors. Grounds only admission costs $11. To confirm opening times and admission fees, call 845-265-3638. Located in Warren, VT, The Pitcher Inn offers charming rooms and a number of seasonal vacation activities. 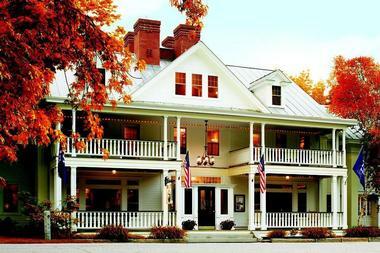 The inn is one of the best romantic weekend getaways on the East Coast. Fun weekend activities range from spa pampering to skiing, cross-country skiing, golf, tennis hiking, cricket, polo, bicycling and shopping. If you are looking for romance, book a sleigh ride in the winter. Book a relaxing massage in the privacy or your own room, or in the massage room. Skiing is available nearby at Sugarbush, with terrain suited for beginners as well as skilled skiers. Arrangements for outdoor activities, such as skiing, hiking and golf can be made with the hotel staff. If you are looking for an active honeymoon destination on the East Coast, book a trip to this unique hideaway. In the summer, a number of golf courses are available in the Mad River Valley, including the 18-hole golf course at Sugarbush Resort. The Mountain Golf School at Sugarbush offers golf classes for all levels. There are nine guest rooms and two suites, most with wood burning fireplaces, jacuzzis and steam showers. The rooms are beautifully appointed and are great on a romantic weekend getaway. The restaurant menus are based on contemporary American cooking and incorporate organic local seasonal ingredients. The wine cellar holds over 6,000 bottles. For an intimate romantic dinner, you can reserve a private dining table in the wine cellar. Guests can unwind in the casual lounge, Tracks, which has a large fireplace, shuffle board, pool table and darts. Summer or fall are great for golf in Mad River Valley. 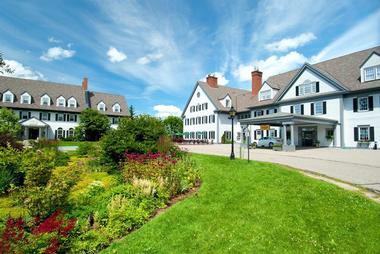 The hotelis approximately a five hour drive from the New York and three hour drive from Boston. It is about an hour from Burlington Airport in Vermont. Rooms inn offers specials & packages. A minimum of two nights is required on weekend. More ideas: Best Romantic Weekend Getaways in Maine. Located near Lake Champlain and Burlington, the Essex Resort & Spa is a great weekend getaway from Boston and NY, offering golf, winter sports, two gourmet restaurant and cooking classes. During the summer, play golf on two 18-hole golf courses: the semi-private Jack Nicklaus-designed Vermont National Country Club course and the new Links at Lang Farm which is located right next to the property. After a round of golf, relax by the outdoor pool and stroll through the fragrant chef's garden with colorful flowers and herbs. In the winter, Stowe, Sugarbush, Smuggler's Notch, Bolton Valley Resort and Mad River Glen ski areas are less than an hour's drive away. 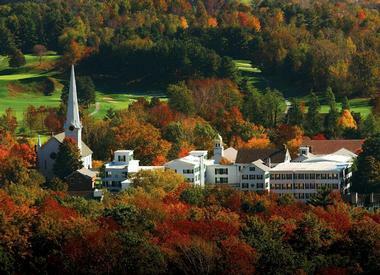 There is also cross-country skiing, snowshoeing, skating, and sledding at Catamount Family Center. For a bit of pampering on your weekend trip, visit the spa. The hotel offers unique culinary vacations that allow you to enjoy customized private dinners, watch cooking demonstrations and take classes at the Cook Academy. Fresh herbs and vegetables used in the restaurants grow in the gardens where guests can relax surrounded by fragrant herbs. The staff can help you plan a variety of adventures in the area, including ice climbing, balloon rides, fly fishing, Ben & Jerry's Ice Cream Factory tours, and classes at the nearby 4 x 4 Driving School. The 120 guest rooms are decorated with warm, vibrant colors inspired by Scandinavian design elements. The property is located about 3 hours from Boston and 5.5 hours from New York. You can also fly to Burlington Airport and take the complimentary shuttle. Rates start at $149 per night. The Equinox Resort in Manchester Village is a luxury getaway offering a wide range of vacation activities for kids and adults. You can take a falconry lesson, learn off-road driving techniques, relax at the spa, and go fishing for trout at the Orvis Fly Fishing School. 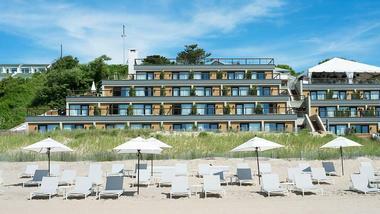 The resort is one of our top picks for best weekend getaways on the East Coast. The spa and fitness center which offers water aerobics, Pilates, and yoga classes as well as personal trainers. The 80-acre Off-Road Driving School offers courses for all skill levels. Junior Off Road driving lessons are available from May through October, on weekends and during holidays. The historic Manchester Village is home to numerous shops and outlet stores where you can shop and save on your favorite brands during the weekend. Gleneagles Golf Course is located just across the street from the main resort building. The course, which dates back to 1927 was restored by Rees Jones in the 90s. The course is named after its famous sister resort in Scotland, the Gleneagles. The hotel has 183 guest rooms, suites and townhouse accommodations. The townhouses have fireplaces and fully equipped kitchens, great for family vacations. If you are planning a romantic weekend getaway, ask for one of the historic suites in the main building, furnished in classical style. The historic rooms and suites sell out during fall foliage weekends in October, Memorial Day, Easter and other holidays, so it's a good idea to book early. Enjoy a formal meal at the Colonnade, or visit Marsh Tavern for a more casual setting. For best views, dine outside at the Dormy Grill on the deck of the Golf Course clubhouse which is open during the warmer season. Remember to book your tee times and spa treatments when making your room reservation to make sure that you get what you want, especially during the busy summer weekends and fall foliage weeks. The resort is located about four hours by car from New York City and Boston, making it an ideal weekend getaway. You can also fly to Albany Airport, 1.5 hours from the hotel. Doubles start from $280, depending on when you go. Situated on 75 acres in the Hudson River Valley, Buttermilk Falls Inn & Spa offers vacationers cozy accommodations, farm-to-table cuisine with organic ingredients from the inn's own garden, and a plush spa. The property has just 10 guest room and 8 cottages, providing guests with privacy and attentive service. Buttermilk Spa has a sauna, steam room, indoor pool and offers a diverse menu of treatments. Henry's at the Farm serves innovative cuisine with ingredients sourced from local farms, including the 40-acre Millstone Farm with a kitchen garden and orchard. Admire scenic views of the Hudson River, gardens and waterfalls from the network of trails on the property. 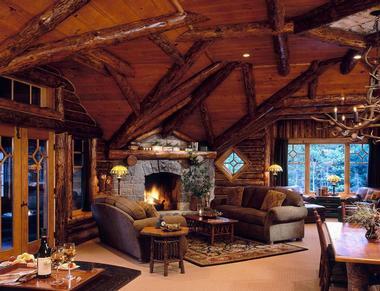 The Point is a luxury property on Saranac Lake, New York, offering attentive service, individually furnished guest rooms with huge fireplaces, and an array of outdoor adventures. Surrounded by the Adirondack wilderness, activities at the resort include swimming, hiking, tennis, mountain biking and sunset cocktail cruises. There is a 18-hole golf course at Saranac Inn four miles from the Point as well as horseback riding at the nearby XTC Ranch. In the winter, go snowshoeing and cross-country skiing across Upper Saranac and along the trails at Mt. Van Hoevenberg outside Lake Placid. If you like ice fishing, the hotel has an ice fishing shanty where you can catch your own dinner. There are eleven luxury guest rooms in four separate buildings. Decorated with antiques, Adirondack furniture and fireplaces of chiseled stone, all of the rooms offer views of the water. The Main Lodge has two wings with two guest rooms each; Eagle's Nest houses three guest rooms and the Pub; the Guest House has three rooms. The Boathouse has just one splendid room located right over the water, perfect for a romantic getaway. Dine in the Main Hall with other guests and enjoy the hotel's creative menu which is new every week. If you have any special dietary requirements, let the resort know well in advance. Guests who prefer to dine alone can have meals served in their room, or bring a picnic lunch on a hiking or canoeing trip. 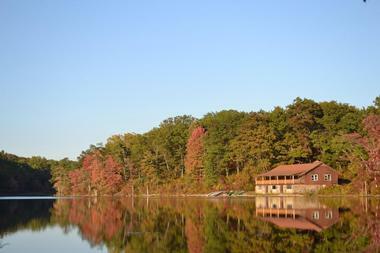 Remember to book early if you are planning a vacation during the fall foliage season. Fly to Saranac Lake Airport aboard Continental Airlines. Alternatively, Burlington and Albany airports are a three-hour drive from the hotel. Doubles start at $1,250 per night, depending on season and availability, including all meals. The wilderness cabins at AMC's Mohican Outdoor Center in the Delaware Water Gap National Recreation Area, New Jersey are located just 90 minutes from New York City. With rates starting at $33 per person per night, smaller private cabins and lodge bunkroom accommodations for larger groups let vacationers relax in a natural setting, surrounded by 70,000 acres of forests and a glacial lake. The cabins are located next to Catfish Pond where kids and grown-ups can jump in for a refreshing swim, go kayaking or canoeing. The nearby wetlands present great wildlife watching opportunities while the Appalachian Trail offers hiking for all levels of fitness. The cabins are self-service - you will need to bring your own sleeping bag and towels (pillows are provided). Guests can also sleep in a 2-person bunkroom or pitch a tent in one of the campsites. The new Demo Center lets you try LOWA boots, LEKI hiking poles, and Deuter Backpacks before you decide to purchase them at the store. If you are planning a family reunion, the entire camp can be rented for exclusive use, including all lodges, campsites, the Boathouse and Dining Hall space. Be sure to book early, especially during the summer. More vacation ideas: 25 Best Things to Do in Key West, Florida. More places to visit: Best Romantic Weekend Trips in Vermont. The Whiteface Lodge is a relaxing summer getaway in Lake Placid, offering a choice of outdoor activities, relaxing spa treatments and stylish accommodations with rustic accents. 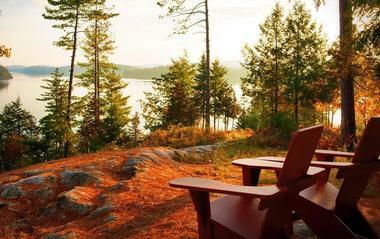 Guest accommodations are decorated in an elegant Adirondack style, with hardwood furnishings and hand-forged accents. Each of the 94 hotel suites features a jetted tub, a cast iron gas fireplace and a LCD, high-definition television. In the summer, relax outdoors on the private cedar and mahogany balconies, taking in the surrounding nature. The Spa offers a menu of signature treatments, including facials, massages and body treatments. Kanu restaurant serves Classic American Cuisine, using the freshest local organic ingredients, fish and game. Suites start at $588/night in the summer. Rates are lower in the off-season. 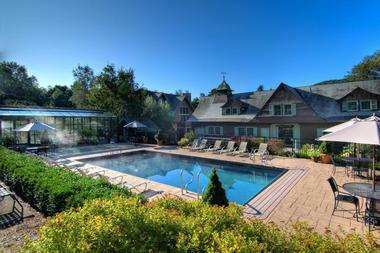 Castle Hill Resort is a relaxing weekend getaway in the heart of Vermont's Green Mountains. The resort has a full service spa and luxury accommodations which include historic rooms in the mansion as well as resort homes. There are many activities to choose from, both in the summer and in the winter. Okemo Mountain Resort offers an abundance of ski trails, cross country skiing, snowboarding, snow shoeing, snowmobiling, sledding and sleigh rides for children. In the summer, the area offers outdoor adventures such as hiking, biking, fly fishing, scenic gondola rides and many others. The Aveda Concept Spa offers many relaxing treatments. Guests have access to fitness classes which are held in the solarium. The resort offers packages for couples such as the Anniversary Package and the Elopment Package which make it easy to plan a quick romantic trip to Vermont. The property is located in Southern Vermont near many attractions and outdoor activities. The nearby Ludlow offers shopping, restaurants, attractions, summer lawn concerts and country fairs. The Anniversary Package starts at $699 for a two-night weekend stay and includes Champagne & strawberries, a three-course dinner and a 50-minute couples' massage. Rooms start from $279 per night. 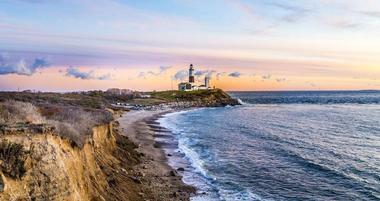 Gurney’s Montauk Resort & Seawater Spa prides itself on being the only resort within the Hamptons that is open all year round, featuring gorgeous beach views. The oceanfront rooms and suites are supplemented by studios and cottages, with the latter featuring a kitchen as well as one to three bedrooms, a terrace, and fireplace. Each oceanfront room has a private veranda and floor-to-ceiling windows to take advantage of expansive beach views, with Wi-Fi and Bluetooth providing high-end technology. The Seawater Spa includes a fitness center, ocean-fed and sand-filtered heated seawater pool, Finnish rock sauna, Roman baths, and salon and cosmetology services. This includes six body treatments, three Thalasso treatments, seven body therapies, three aromatherapies, and ten massages in addition to special spa packages. The Seawater Grill at Gurney’s has ocean-fresh fare in an elegant dining room with panoramic ocean views, The Beach Club is a full-service restaurant right on the beach, The Ocean Cafe has casual dining with ocean views, and The Market is a grab and go cafe perfect for breakfast or a snack. If you don't keep a car in NYC, take the Hampton Jitney. Rooms start at $185 per night. Mirror Lake Inn, located in the Olympic Village of Lake Placid in the Adirondack Mountains, offers elegant rooms, a spa and a number of seasonal activities. Located 5 hours from New York City and Boston, the inn is a great year-round getaway. Guests enjoy a number of activities, including a natural private beach, outdoor heated pool, tennis, a spa, a private outdoor ice skating rink, and nearby golf and skiing. The spa offers a range of services from massage, body treatments and facials. There is an indoor 60 foot lap pool with a waterfall and a panoramic view of the water, a jacuzzi, a sauna and a cardiovascular exercise room. Guided outdoor adventure trips are available at extra cost and include hiking, canoeing, fishing, rock climbing, skiing, snowshoeing, or mountain biking in the Adirondack wilderness. Some of the 128 guest accommodations have a view of the water and a private balcony. The split-level suites feature an oversized whirlpool bath, living room area, a custom-made oak spiral staircase leading to a king-bedded loft, and a balcony. Summer is a great time to enjoy a range of outdoor activities. USAirways flies to the Adirondack Airport, 16 miles away. Amtrak service from NYC stops in Westport, 40 miles away. Shuttle bus service must be arranged with a reservation. Adirondack Trailways operates a bus service from New York City. 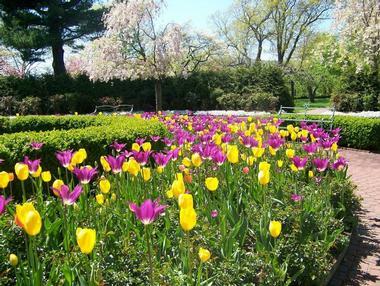 More day trips from NYC: the Bartlett Arboretum & Gardens in Stamford, Connecticut. More weekend trips from NYC: Best Long Weekend Getaways from NYC with Kids. Located in the picturesque Hudson Valley only 90 minutes from New York City, Mohonk Mountain House is a historic weekend getaway surrounded by 26,000 acres of woodlands and the scenic Lake Mohonk. Guest accommodations are located in a beautiful castle-like building with a Victorian character and sweeping views. If you are looking for relaxing vacations from Manhattan, you don't have to go far. The hotel has a luxurious 30,000-square-foot wellness center, a tennis center, stables, a 107-year-old 9-hole Scottish golf course, spectacular gardens, 18,000-square-foot Skating Pavilion and 85 miles of hiking trails. Read more about New Paltz and other day trips from New York City. New York State is vast and beautiful, from laid-back sandy beach towns and romantic lighthouses to lush forests and amazing fall-foliage displays. Some of the best places to visit in New York include Niagara Falls, the Hudson Valley, Long Island and the Adirondacks. Nearby states offer plenty to see and do as well, including Connecticut, Pennsylvania, New Jersey, Illinois, Massachusetts, Maine and Vermont. Below is a collection of unique places to stay near New York City. Located in downtown Wilmington, Delaware, Hotel du Pont is a historic getaway offering romantic wedding venues and gourmet dining. The property originally opened in 1913 and showcases European craftsmanship. There are many dining options, including the Four-Diamond AAA award Winning Green Room serving French cuisine in a grand setting. The more informal Grill offers cafeteria-style seating. Light snacks are served at Java Corner and at the Bar. There is a choice of venues for an elegant wedding, holiday party, shower and other celebrations. The staff can help you plan the perfect event from start to finish. For lavish weddings, book the Gold Ballroom which features rich wood and the hand-crafted medallions of twenty famous women, from Helen of Troy to Cleopatra. The nearby 1200-seat DuPont Theatre hosts Broadway shows. Rates start from $149 per night. More quick trips: 28 Best Romantic Getaways in New York and 25 Unique Romantic Fall Vacations in New York State. Just a short drive from New York City, the Lower Hudson River Valley features historic buildings, scenic views and many vacation activities. Whether you are interested in shopping or visiting historic sites, the Lower Hudson is a quick spring and winter weekend getaway from the city. Several historic estates managed by Historic Hudson Valley in Westchested County are located close together near Tappan Zee Bridge on Route 9. During the warmer months, the beautiful grounds of Sunnyside and Lyndhurst offer a perfect setting for a picnic lunch. You can also visit the Philipsburg Manor, Kykuit and Van Cortland Manor. Continuing north along the valley, there is the Bear Mountain State Park, the U.S. Military Academy at West Point, Boscobel and the Storm King Art Center. The Lower Hudson River Valley is home to several charming inns and B&Bs. More ideas: Romantic things to do in DC and romantic DC restaurants. Since Kykuit is less than an hour from the city, head there if you are looking for romantic day trip ideas. If you are interested in historic buildings, gardens and 20th-century sculpture, Kykuit is just the place. Not all great getaways from NYC have to include an overnight stay. Home to the Rockefeller family, this historic estate is a great place to visit, offering scenic views of the Hudson River, formal gardens with fountains and a collection of art. Since tickets are sold on a first-come, first-served basis you should get there early, especially on weekends. Tours are offered daily, except Tuesday, from the end of April through the beginning of November. The Visitor Center opens at 9 am to sell tickets for that day only. It's a good idea to confirm opening times before you go. Admission is $25 for adults, $23 for seniors and $23 for children 3-17. If you are traveling from New York City and don't have a car, Metro-North offers a Kykuit package tour starting at $41.25 per person. On your trip to the Hudson River Valley, Lyndhurst is a must-see. This Gothic Revival mansion, designed in 1838 by Alexander Jackson Davis, offers beautiful views of the Hudson and its grounds. There is a pretty rose garden, a large greenhouse and a carriage house where you can have lunch. Lyndhurst, located at 635 South Broadway in Tarrytown, offers guided and self-guided tours. The mansion is open to visitors from mid-April through October, Tuesday through Sunday and Holiday Mondays, from 10 am to 5 pm. From November to mid-April, Lyndhurst is open weekends only and Holiday Mondays, from 10 am to 4 pm. There is an admission fee (914-631-4481). The Storm King Art Center in the Lower Hudson River Valley is a unique art museum featuring more than 100 sculptures exhibited on 500 beautiful acres of fields and woodlands. Located on Old Pleasant Hill Road, in Mountainville, New York, the art center was founded in 1960. The permanent collection of sculpture, which includes works from 1945 to the present, features several specially commissioned site-specific works. There are also temporary outdoor and indoor exhibits. This charming stone mansion is one of the most famous attractions in the Hudson Valley. Sunnyside was the home of Washington Irving (1783 - 1859) who wrote short stories such as The Legend of Sleepy Hollow and Rip Van Winkle. Sunnyside is located on West Sunnyside Lane in Tarrytown. On your tour of Sunnyside, you will be lead by guides dressed in mid-Victorian period costumes which fit well with the surroundings. On a warm day, bring a picnic lunch which you can enjoy on the grounds. Sunnyside is located on West Sunnyside Lane, off Route 9 in Tarrytown, New York (914-631-0081). 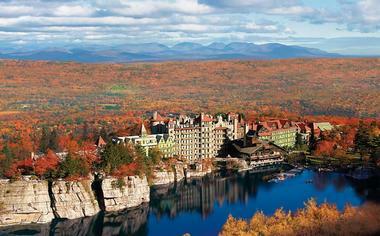 See more trips from NYC: Vermont, Maine and the Finger Lakes. If you have time for a three-day weekend, head to the warm beaches of Florida or the Bahamas. 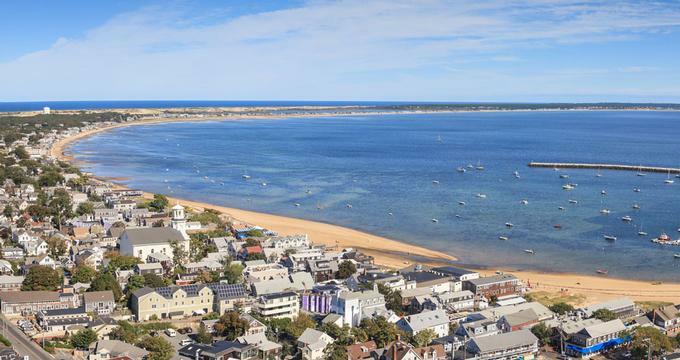 Famous for its picturesque beaches, pretty lighthouses, and historic homes, the small and beautiful island of Nantucket off the coast of Cape Cod offers a peaceful and relaxing escape. From the prestigious Relais & Chateaux Wauwinet and the popular White Elephant that overlooks Nantucket Harbor, to the historic inn of Jared Coffin House in the heart of town and deluxe waterfront cottages at the Boat Basin, there is plenty of choice. A wide range of excellent restaurants, offering everything from casual fare to fine cuisine, can be found throughout the hotels, so you will never be a loss for delicious food. For spa enthusiasts, The Wauwinet and the White Elephant offer exclusive seaside spas for a day of pampering. To get to Nantucket from NYC, drive to Hyannis and take the 1-hour ferry. Alternatively, you can catch a flight from LGA or EWR. Find romantic restaurants and things to do on Nantucket.